Seems I was on to something with the comments I made towards the winter games this year. Vancouver organizing committee (or Vanoc) is getting a lot of questions. Just the mere fact that Vanoc is getting mentioned, an organizing committee, is surprising. When has that ever happened? Really. It only happens when bad things go down. Bad things like terrorist attacks. Putting it in perspective like that makes you step back. No attacks on the Vancouver games so my cynicism should only take my comments so far. 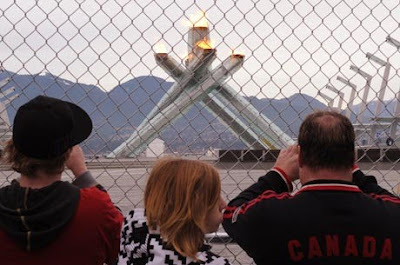 It's unfortunate that, among other things, the snow is melting and it stinks that there is a chain link fence preventing people from getting within 100 yards of the Olympic Flame. But the biggest stinker of them all is that I have to qualify things against a terrorist act. Can't the games just be poorly managed? Honestly, who designed the plans for a chain link fence around the flame? And, did they pay him/her? There I go being cynical again.